Analogue signals are great in that they are simple enough to generate and demodulate, but they suffer in that the signal quality degrades when sent over a noisy radio link. With radio voice systems, this is heard as pops, crackle, hiss etc. and the problem gradually gets worse as signals get weaker. Human ears do a remarkably good job of dealing with noise but it can get tiring when listening for long periods. Way back in 1948, Claude Shannon proposed that digital coding systems can be designed in such a way that error-free transmission can occur even through a very noisy channel. My first encounter with amateur radio using error-correction was operating AMTOR in forward error correction mode on the HF bands, from the station of G3IUB at the University of Birmingham in the early 1990s. The station consisted of a Trio TS-520S transceiver (yes, valves!) coupled to an AEA PK-232 terminal node controller, with an amber screen serial terminal made by Wyse. It was actually quite impressive to watch the text on the serial terminal edit itself, so that rogue characters got corrected as more data came in over the air. Although I’ve been a radio amateur for decades all of my voice transmissions have always been carried by analogue radio signals, modulated by various combinations of phase, frequency and amplitude. However, the increase in computing power and falling costs over time have now put digital voice modulation schemes within reach of the radio amateur. Recently, several competing amateur radio digital voice systems have come into existence. Sadly, they are largely proprietary and do not interoperate. After all, there is just one radio manufacturer behind each closed protocol. This goes against the spirit of amateur radio (which in my mind is the original open-hardware movement) and it shouldn’t be necessary to buy a specific type of transceiver from one specific manufacturer just to operate in a specific mode. In 2005, the European Telecommunications Standards Institute (ETSI) ratified a specification for a digital voice modulation scheme. This has been adopted by PMR radio manufacturers and is growing in popularity throughout the world as a new PMR radio standard. Although the voice codec used is proprietary, the specification itself is open and so it lends itself to easy investigation by radio amateurs. So, I have decided to jump on this particular band wagon. As well as the usual PMR manufacturers, there are now a range of Chinese manufacturers producing DMR compatible equipment very cheaply. I managed to source an MD-380 hand-held radio from TYT, with a drop-in charger, two antennas and a hands-free microphone all for less than £100, including delivery to the Isle of Man. First impressions are that the codec is somewhat brutal. Everyone sounds somewhat robotic, but once you’ve got used to that the audio is very intelligible. Unlike analogue FM, there is no hiss. No background crackle. None of the multi-path ‘flutter’ you get on stations in moving vehicles. A very strong FM signal probably sounds better than DMR but for hand-portable radios strong signals are rare. Listening to perfect audio from DMR in weak fringe areas is much better than struggling to pull a voice out from the noise you’d hear on FM. You also get other value-added features with the DMR protocol that you don’t get with analogue FM. Each radio has an unique identity, so you can match that up to a user’s call sign and have your radio display the call sign of the person you’re listening to. That’s great if your memory is as bad as mine, and it takes some of the stress out of mobile operating. Also, DMR was designed with repeater infrastructure in mind which means that roaming between coverage areas is seamless, with no need to fiddle with your radio while driving. 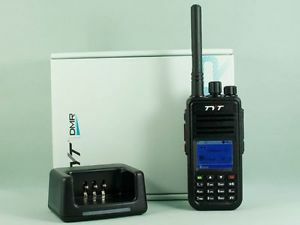 DMR is also a time-division multiplex system which means that two separate conversations can occur simultaneously in one 12.5 kHz wide radio channel. You can also see the received signal strength from the repeater at the same time as you’re transmitting into it! Of course being digital, sending data between repeaters via the internet is easy and so a worldwide network of linked repeaters has sprung up. This means that noise-free global communication is now possible from one hand-held transceiver to another. Thanks to the hard work (and deep pockets) of two local amateurs, we have two linked DMR repeaters on the Isle of Man. since my early days on what was the post office engineering as a tech i too have been following techniques which would make noise free voice transmission possible. when in 1981 i became a radio amateur whilst being involved in setup of the paging for nationwide use. The Tdm system which was just basically for data was used this found it’s way into voice wayback in the early 1980’s as the PCM systems. we amateurs have been so deeply involved in it’s concept in the early years. long before it was a commercial project. so when i read about how we are now using it . it sounds like some sort of joke. To be honest without amateur radio and us geeks involved in these so called new protocols there would be none of these ideas. Only when it comes to light some years later as a so called new concept it makes some of us laugh. As we have seen it all before. so now i come to the crunch what is the point of all these different systems if all you end up with is plain speech. which could be mixed together in a switch and so what ever protocol is used it comes back to audioable sound. surely this is common ground. where one system could be fed into another.minus the noise issue. such as a telephone switch system with routing digits. Thanks for your comment. We’re starting to see exactly what you describe now. Some folks are linking together the digital audio streams from DMR, D-STAR, Yaesu System Fusion etc. and making it so that one digital voice system will operate with another. I agree that radio hams have always been involved with innovation and new ideas. We pioneered SSB modulation on the HF bands, developed AX.25 packet radio before the internet, and APRS position reporting which I’m sure is where the AIS system used in shipping was born from. I think we’re only just seeing things like DMR emerging in amateur radio because the commercial adoption of these systems has driven down the costs of equipment, even though the technology behind them was probably dreamt up by hams years ago!